Updated: This morning I found “my” cafe: Caffe Turreno. It’s just up the street on Piazza Danti. For 2 Euros, 10 centessimi: one brioche and cappucino. Plus, free wifi. I’ve uploaded some photos. 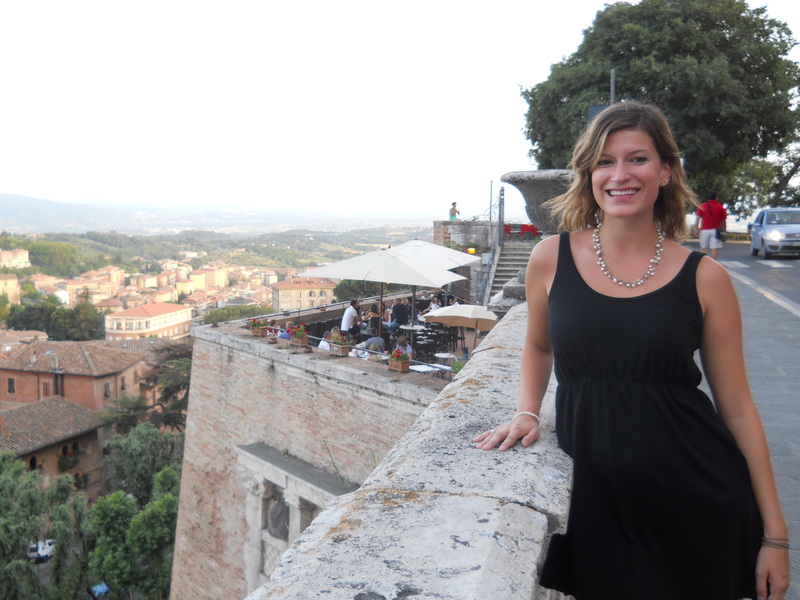 The first is of Caroline at the walls from which we can view Assisi. The next is the top of the Etruscan arch of the ancient walls. It was rededicated in 40 BC by Augustus. The buildings on top were added in the Renaissance. It begins our street: Via Ulisse Rocchi. 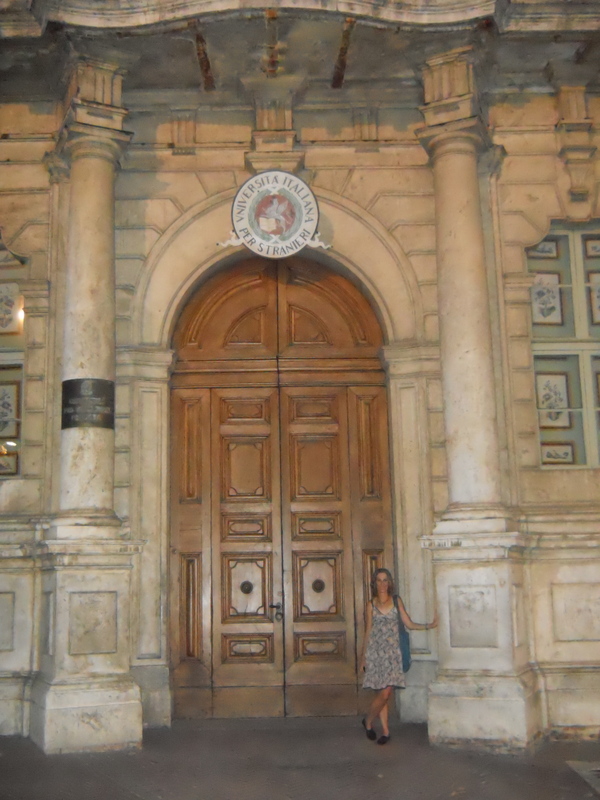 The next photo is of me in front of my new school, again, right across the street from the Etruscan Arch. 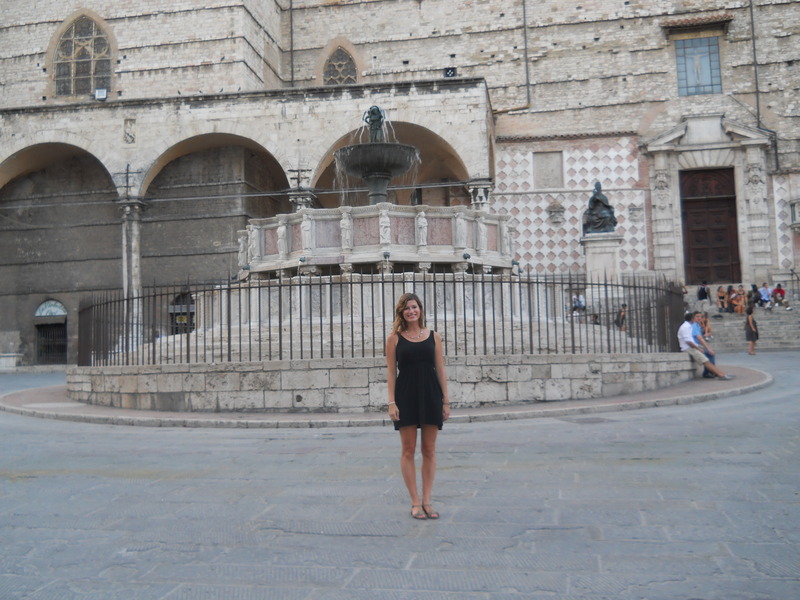 Then is Caroline posing in front of the Fontana Maggiore. It was built in 1276-78 to celebrate the completion of an aqueduct, which brought water into the town from the nearby mountains. 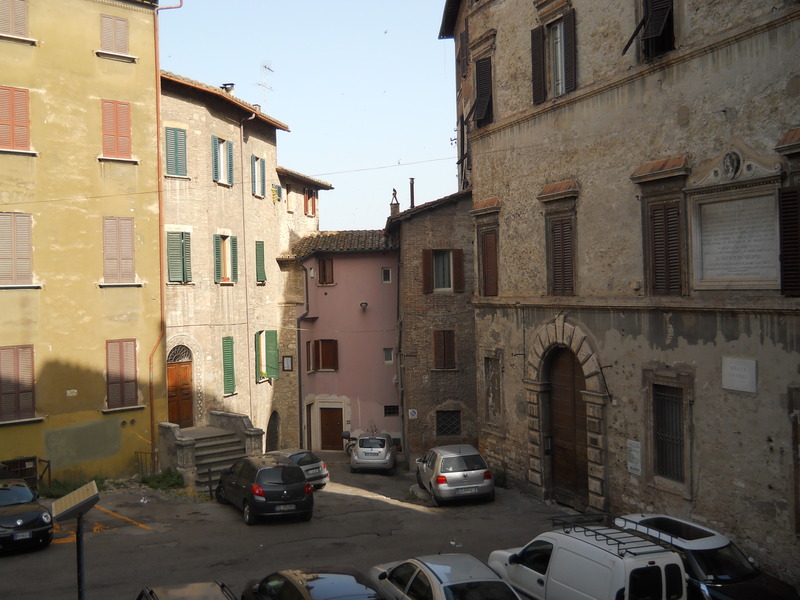 Just above is a view from my apartment bedroom of Piazza Ansidei It is right between the Etruscan arch and the main piazza, IV de Novembre. 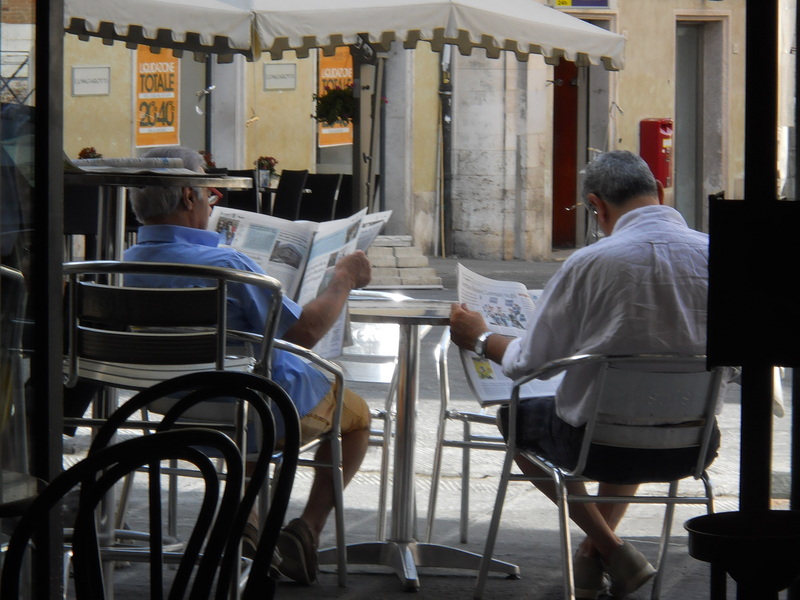 Here are some locals reading the Sunday papers. The photo of the street under the arch is a famous shot of the ancient aqueduct. It is one block also from our apartment. The centro or old town is very compact. But it feels very different from other places we’ve visited. For one, you’ll be on a nice, pedestrian boulevard, and then you go up to an alley, and it feels very rundown. It definitely feels more real than a place like Assisi, which is Disneyworld clean. This place has moaning pigeons and their dung, crumbling walls, graffiti, wild cats, some trash, smells a little in places, and yet, as you can tell from the photos, it’s also very beautiful. 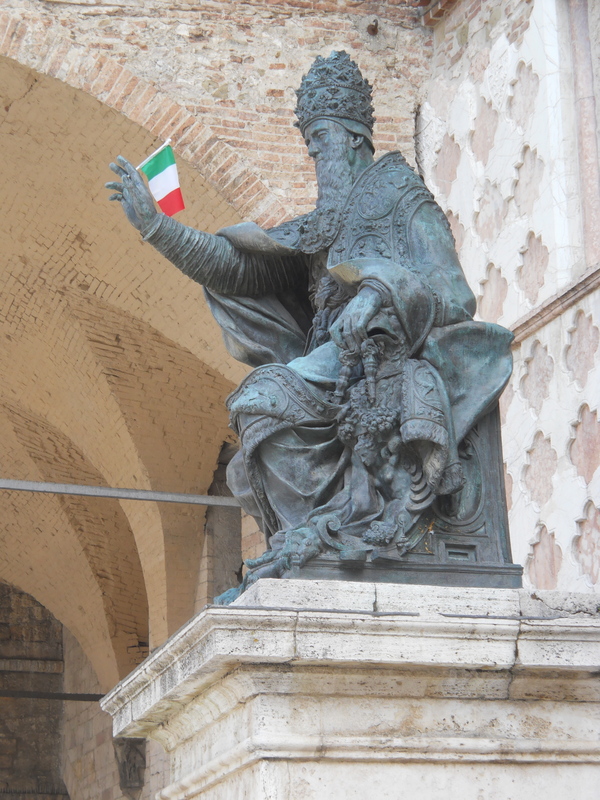 Finally, here’s a photo of some pope with an Italian flag. The big Euro Cup game is tonight. Should be exciting! P.S. People were “partying” on our street as late as 3 am. Watch out if Italy wins tonight! Earlier post: June 30: I guess I was most nervous about today’s trip. We did find the rental car place to return the car, but it closed at 12:30 on a Saturday. Who knew? It was also really hot and deserted when we arrived, and since we were checking in a day early, we had to wait while the maid cleaned the place. So, I was a little worried. It seemed smaller and shabbier than on the Internet. Can I really stay here for a whole month? But once we went out at six, my doubts faded. 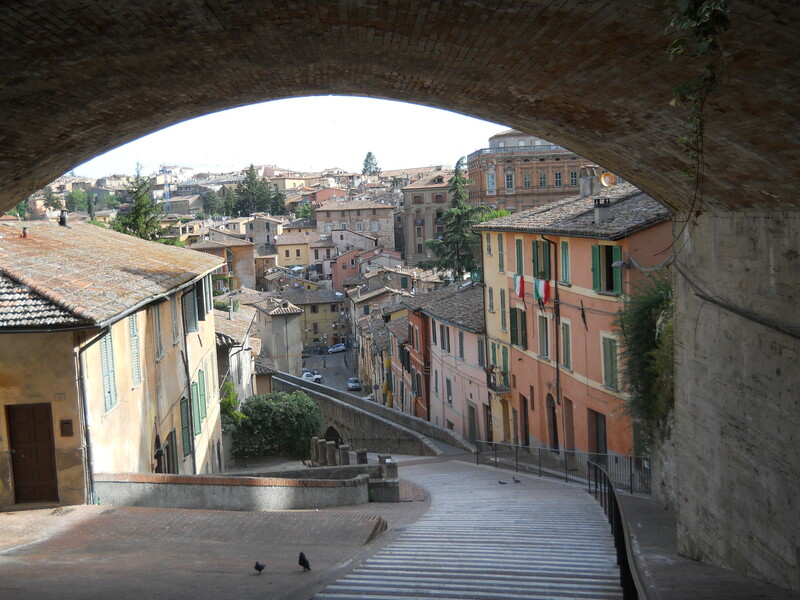 Perugia is a happening town, and once again, we are in the best location. One long block uphill leads to Piazza Danti and then the main piazza, Piazza IV Novembre with the medieval Fontana Maggiore and the Duomo. There are long pedestrian streets with lots of shops and cafes with tremendous views of the hills and town below. 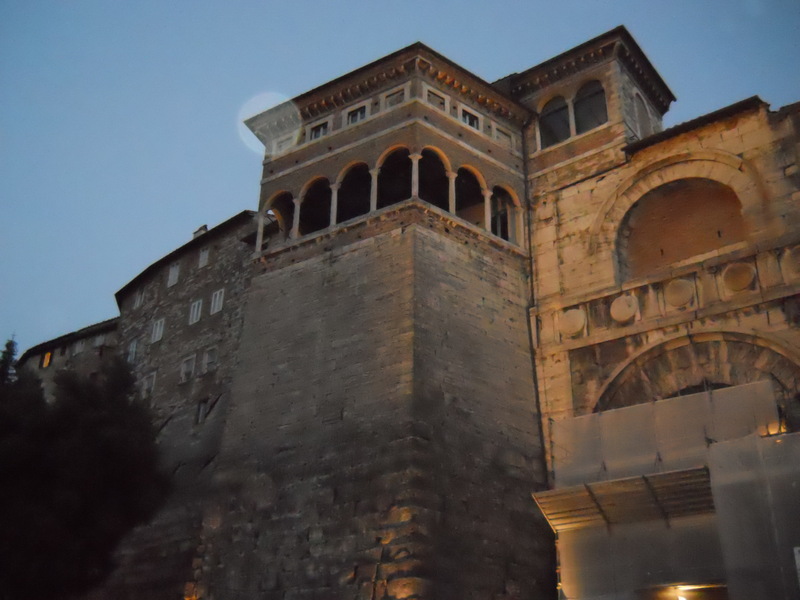 We can see Assisi from our walls! We’re somehow sporadically getting on someone’s wifi without a password, but I can’t get C’s laptop on for loading photos. There is a food festival happening on our street tonight. Also, my school, the Universita per Stranieri, is one block down the hill. Will try to post photos later if I can get C’s laptop on. Oh, we had lunch with Ron today in Assisi. He and Bridget are officially engaged.